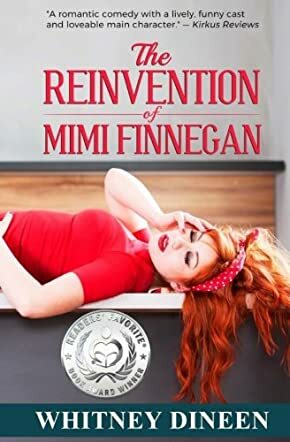 The Reinvention of Mimi Finnegan by Whitney Dineen is a delightful chick-lit story told in a funny and adorable way. Mimi reaches an early mid-life crisis that begins with the diagnosis of a bunion. Constantly comparing herself to her clever and successful siblings, Mimi has always struggled to find her own identity. The fact that she is single doesn’t help her self-worth. Obsessed with her weight, her appearance, and her apparent failure to accomplish anything in life continues to drag Mimi down to the depths of despair. All that changes when she meets Elliot Fielding. She immediately jumps on the roller coaster of infatuation that quickly turns to true love, but - even now she has finally found someone she could share her life with - she discovers he is in a serious relationship with another. The humour of this novel is its absolute charm. Captivating the reader from the start, the first person approach is spot on. The author, Whitney Dineen, must have a brilliant sense of humour herself which shines forth in her writing. I love the way even a visit to a burger bar can engender such hilarity. A really great read that I didn’t want to put down. It made me chuckle throughout, even with the sad parts. I shall certainly seek out other work by this author. It’s ideal for its genre, chick-lit, but would also work with comedy fiction. Watch out Bridget Jones, Mimi Finnegan is on your tail. Wilhelmina and the Willamette Wig Factory: The Willy and Tommy Adventures, Book 1 is a young adult and pre-teen paranormal fantasy novel written by Whitney Dineen. Wilhelmina Snodgrass is most definitely not impressed by her parents’ decision to move from their home in Mason, Illinois, to Monteith in the Willamette Valley of Oregon. The eleven-year-old Willy was looking forward to beginning the new school year as a seventh-grader and being part of the swim team. She misses her friends who are probably back home practicing for the swim team tryouts. It’s different for her eight-year-old brother, Wendell, who’s already running around the street with brand new friends, but boys are not all that discriminating about who they play with anyway. Willy’s mom is sympathetic to her daughter’s woes. It’s not easy being in that tween state between kid and teen. She figures a shopping trip might be the answer to lifting her daughter’s blues, and it works a treat. In the first cool clothing store they find, Willy meets Charlene, a salesgirl who loves Willy’s red hair and just happens to have a sister who is Willy’s age. To make things even better, they’re practically neighbors. Whitney Dineen’s young adult and pre-teen paranormal fantasy, Wilhelmina and the Willamette Wig Factory, is a fresh and original story about a young girl’s move to a new town and the friends she makes when she gets there. The outspoken Tommy is a marvelous counterpart for the somewhat diffident Willy, but I’d find it hard to point out any character in this enjoyable, haunting and haunted tale who wasn’t expertly crafted and quite believable. I loved the supernatural aspect of the plot and enjoyed seeing how Tommy and Willy interacted with Mrs. Carbunckle’s dead relatives. Monteith, Oregon is an inspired historical setting for this story, and the efforts the girls and their friends make to reopen the wig factory makes for an exciting and entertaining tale. Dineen leaves a few clues scattered throughout the story about the continued adventures of Willy and Tommy, and I’m looking forward to the subsequent volumes in this series. Wilhelmina and the Willamette Wig Factory is highly recommended.